What is the Sky Arch? The Sky Arch is a rift between worlds. You can send some of your regiments on an expedition here. Successful expeditions will reward respective regiments with experience and they will pick up loot on the way. 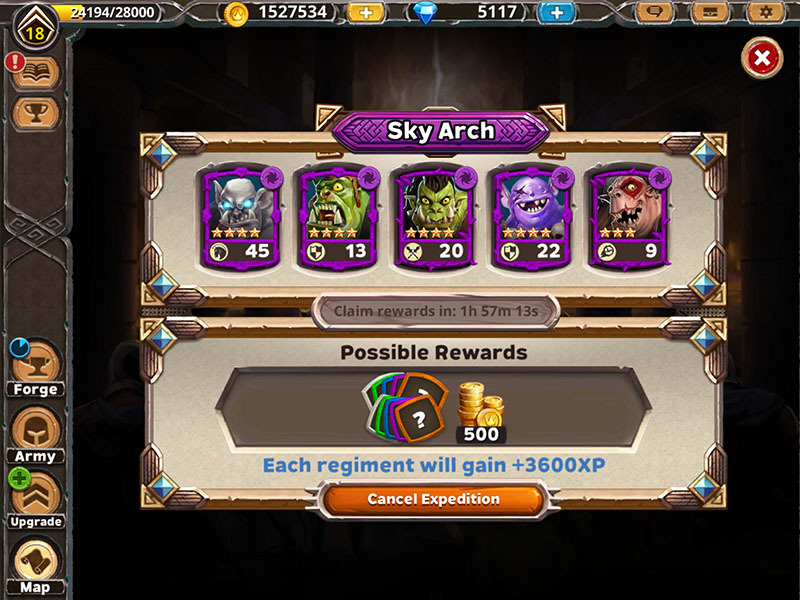 The amount of experience gained in the Sky Arch increases with your Warlord Level and with the duration of selected expedition. The longer the expedition will take, the more experience your regiments will gain. An expedition lasting 16 hours will grant them the highest amount, however if you would send them on two separate 8 hour expeditions, they would earn more experience in total. The highest amount of experience when compared directly, your troops will earn when being sent on 8 separate 2 hour expeditions. When a regiment has reached Rank 23, they won&apos;t be able to accumulate more experience. Only fully recovered regiments can be sent on an expedition. In the beginning you will only be able to send one regiment on an expedition. Later on, you can unlock more slots after having completed a number of expeditions, or by unlocking them with Gold. Note: You can also cancel any running expedition at any time, but will not received any rewards. You should only do this if you really need these regiments in battle immediately.